Must I pay him extra? In 2016 I engaged a painter for my house and he gave me a quotation for P30,000 for supplying and fitting. He said I should pay 60% or P18,000 deposit. I also paid the P12,000 balance when he completed the project and invoiced me. Later on he complained that he used a different material from the one he had quoted initially. He keeps phoning and visiting me demanding extra P10,000. So I want to stop him from following me as I have fulfilled the agreement. How can I stop him from pursuing me? I think this painter might have been drinking some of the chemicals he uses to strip paint off walls. Either that or he's deluded. He certainly has no idea how business works. Maybe you were his first ever customer? The simple facts are that unless you agreed to pay him the extra money then you have no obligation to do so. He told you in the quotation that the work would cost P30,000 and I assume the invoice he gave you when he had completed the work was for the remaining P12,000? If that's true then you've paid him the full amount that you both agreed you were meant to pay. You certainly don't need to pay for his lack of competence in estimating the materials he was meant to use. I suggest that you write him a letter saying this and telling him to stop bothering you. If he doesn't stop then go to your local Police station and lay a charge of intimidation against him. If the Police have forgotten, remind them that his behaviour is contrary to Section 234 of the Penal Code of Botswana. If you think he needs some education, you might want to tell the painter that the maximum sentence for intimidation is three years of free accommodation courtesy of the State. I need your help please. I had a store credit card back in 2010 while I was still at tertiary. I had a balance of P1,500 when I finished school. Since then I never got anything income generating enough for me to pay them back they took my debt to the debt collectors. Now these guys are on my case telling me that I now owe them P3,000. Since I'm not working I will have to pay at least P100 monthly but then monthly there will be interest of P70 How legal and legit is this? Unfortunately for you this is completely legal and legit. This is how debt often works. It doesn't matter whether it's a bank loan, a credit card, a hire purchase agreement or in this case a store card, if you don't pay the lender what you owe they're going to start applying interest and penalty charges to the amount you owe. As in your case, you can easily see your debt double over a couple of years if no payments were made. Eventually they'll hand over the debt to a debt collector who'll chase you down and do their best to reclaim as much as possible from you. However, the good news is that if you sit down with the debt collector they're likely to agree a repayment plan with you that both satisfies their desire for the money and your ability to afford it. No debt collector wants to take a debtor to court, they want to get their money as easily as possible. I suggest that you agree a payment plan with the debt collector and then do your very best to stick to it. And the lesson? Store cards are often marketed to us as something convenient for us, the consumers. 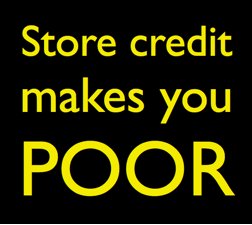 In fact, it's just another way for stores to lend us money and then to charge us credit-card like interest rates. Please so your very best to avoid them!